Recently, there are lots of homeowners who preferred wood flooring for their houses. A lot of them prefer the classic type of hardwood over tile or decorated carpet for flooring because it is easy to clean and to maintain. Why Should Consider Wood Flooring? The real reason is that it actually enhances the look of your home. Wood flooring does not only add a touch of quality to your home but also a fairly amount of warmth in it. Homeowners believed that having wood floorings makes the home or space in your home looks bigger. Also, it makes your home feel more inviting! Aside from it feels inviting, the beauty of wood flooring depends as well on the rest of your home décor. Most people say that first impression lasts, so better choose something that could benefit you a homeowner. 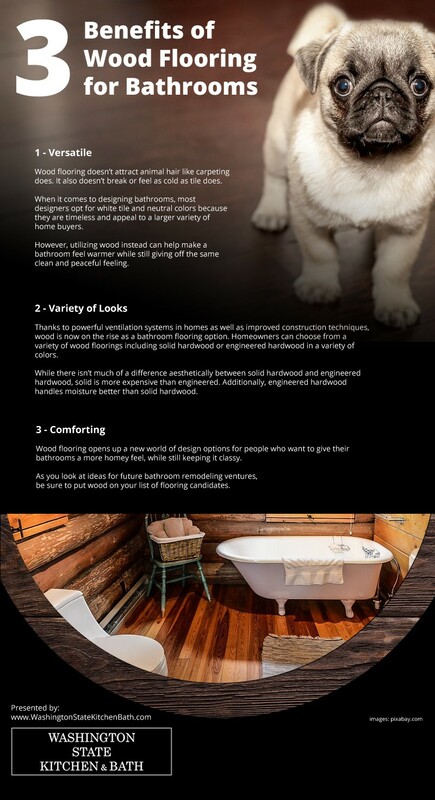 Below we listed the three (3) reasons why homeowners will benefit from installing wood flooring in their bathrooms. Wood flooring is low maintenance – meaning it is easy to clean and maintained. The dirt can be swept, vacuumed or steam-cleaned to remove it. To think, that you are not cleaning often. Meanwhile, knowing wood floors are not harbouring any environmental hazards, such as animal hair (dog, cats, and domestic pets) or dust mites. It does not break easily or you may feel cold as tile does. When it comes to designing the bathroom floors, interior designers prefer white or neutral-colored tile. These color are timeless and appealing to a larger variety of home buyers. But then, by utilizing wood can help make the bathroom feel warmer. At the same time, it is clean and has a peaceful feeling. Aside from versatility to adapt every interior design theme in your house, wood flooring comes in a variety of selections. Also with the proper ventilation system in homes can improved construction techniques which now wood is on the rise as a bathroom flooring option. Today, many homeowners can choose from a variety of wood floorings such as solid hardwood or engineered hardwood. There isn’t much of a difference between solid and engineered hardwood as solid is expensive compared to the latter. Wood flooring opens up a new world of a design option. For those that want to give their bathroom homier feels while keeping it classy, wood flooring is suitable for you. The wood flooring is easy to maintain, provides better air quality and durable. Although, they may be expensive there are factors to consider. Imagine the long-term costs. Aside from it is easy to maintain, it is likely to be damaged too. It may able to reduce your cleaning costs as well as repair costs over the years and can last for decades. The long-lasting quality and comfort make them money saver flooring option. This might be expensive but in the end, will save you more money! Wood flooring is a great option if you consider bathroom remodelling ventures. Is wood flooring a good choice for bathroom flooring? Yes, it is. Imagine upgrading your bathroom flooring! They are a great choice with a long list of benefits. Try to call and talk to design specialist in your hometown to learn about these options.